Belgium’s Eden Hazard has played down the comments he made about team-mate Romelu Lukaku after their 3-0 win over Panama. Dries Mertens put Belgium ahead just after the break before a Lukaku double sealed the win in Sochi. 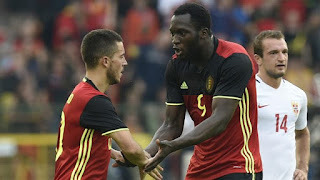 Belgium were criticised for their first-half performance and Hazard said he had to speak to his team-mate at half-time to talk about how he felt he was “hiding up front”. He later admitted he did not “regret what he said”. “I just told Romelu [Lukaku] if we want to win the game we need him, not just as a scorer to score goals, but we want him to be involved in the build-up. Hazard had told the BBC “it was not easy playing with a man missing” but when he was in the game he created some “magic”.